Islamic State fanatics claim to have constructed a dirty bomb after stealing 40kg of uranium from an Iraqi university. Militants boasted of the device on social media, with one even commenting on the destruction such a bomb would wreak in London, four months after the chemical was reported missing from Mosul University. Among extremists making online threats to the West is British explosives expert Hamayun Tariq, who fled his home in Dudley, West Midlands, for the Middle East in 2012. Using the Muslim name, Muslim-al-Britani, he posted on Twitter: ‘O by the way Islamic State does have a Dirty bomb. We found some Radio active material from Mosul university,’ the Mirror reports. He continued: ‘We’ll find out what dirty bombs are and what they do. We’ll also discuss what might happen if one actually went off in a public area. ‘This sort of a bomb would be terribly destructive if went off In LONDON becuz (sic) it would be more of a disruptive than a destructive weapon,’ before having his Twitter account suspended. 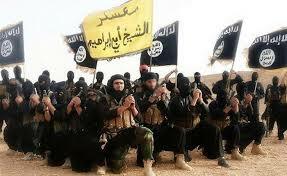 ‘IS has confirmed that we have acquired a dirty bomb from radioactive material from Mosul Uni! Mashallah #IS’. In July nearly 40kg of uranium stored for scientific research went missing from Mosul University in northern Iraq. Yesterday, as news the uranium had been used to construct a bomb, one jihadi taunted Iraq’s reported plans to retake control of Mosul.